Kubo (Art Parkinson) has a gift. He is an epic storyteller. However, Kubo's quiet existence is shattered when he accidentally summons a spirit from his past which storms down from the heavens to enforce an age-old vendetta. Now on the run, Kubo joins forces with Monkey (Charlize Theron) and Beetle (Matthew McConaughey) on a thrilling quest to save his family and solve the mystery of his fallen father, the greatest samurai warrior the world has ever known. With the help of his shamisen - a magical musical instrument – Kubo must battle gods and monsters, including the vengeful Moon King (Ralph Fiennes) and the evil twin Sisters (Rooney Mara). Set in a fantastical Japan from acclaimed animation house Laika Studios (Coraline, The Box Trolls), Kubo And The Two Strings is a stunning stop motion film that takes us on a wonderful, mythical adventure. demands our attention. Indeed, at the beginning, Kubo warns us against fidgeting or even blinking - to do so would see our hero perish (could we have this warning at the start of every film please?). Kubo And The Two Strings proceeds to tell a powerful story, heavily influenced by Japanese art and culture. Unafraid to explore complex themes of family, conflict, memory and loss, director Travis Knight take us to some dark and scary places. As a result, there are several unsettling scenes in Kubo And The Two Strings. Rooney Mara’s evil sisters are particularly creepy (reminding me of Studio Ghibli films - particularly Spirited Away). While I welcome (and indeed relish) the scares, they may well be too much for younger children. Kubo And The Two Strings is a gorgeous example of the power of stop motion animation. This is Laika Studio’s preferred method of filmmaking and, because the process of moving puppets frame by frame is so unbelievably painstaking, is something of a cinematic rarity. In an interview with BBC Radio 4’s The Film Programme, Knight talks about how we warm to stop motion because, as it has been created by a human artist’s hand, it is imperfect. “As much as we try to make these things as completely perfect as they can be, you are never going to get there because we are human," Knights explains. "In every frame of this movie there are problems, there are things that didn’t quite work the way we wanted them to and I think that’s something that makes it very beautiful. Laika Studios is based in Portland Oregon. The studio would often only create five seconds of screen time per week and Kubo And The Two Strings took five years to complete. Travis Knight’s inspiration to become an animator came from the work of legendary visual effects creator, Ray Harryhausen. Kubo And The Two Strings features an enormous skeleton. This puppet is enormous - 16ft tall and 400lbs. From the age of eight, Knight was fascinated by Japan. He cites the biggest influence on his movie as being Ukiyo-e (which means pictures of the floating world) and the most well known aspect of that art form - the wood block print. Stay right to the end of the film - there is some fascinating footage to see mid-way through the credits. 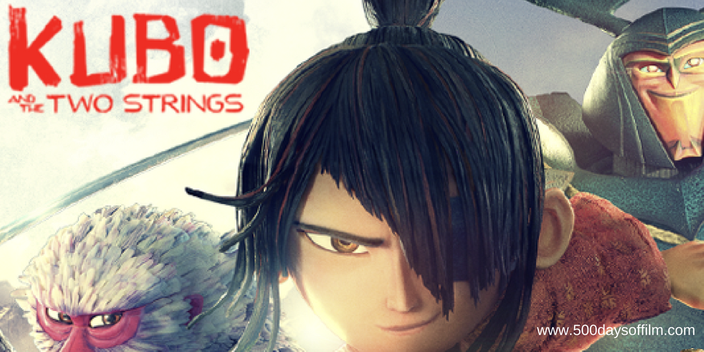 Have you seen Kubo And The Two Strings? If you have, what did you think of Laika’s new animated adventure? Did you love it as much as I did? Whatever the case, let me know - leave me a comment in the box below!